There is a line in the famous movie Ben Hur in which one of his relatives goes to hear Jesus speak. She comes back enthralled. The way she describes Jesus is by saying that he is like no one she has ever met before, that he speaks words of life. And so he did. The Gospel writers add that he spoke as one who had authority. The Message version interprets this as meaning he lived out what he spoke. Our lives have the most impact when we live what we speak. Jesus of course is the perfect example of this. For 2,000 years he has captivated people of all races and colors. There is something about this man that is like no other. He speaks words of life and he lived those same words. He loved his enemies, he walked the extra mile, he denied himself, took up his cross and lived a life of obedience to the Father. Our lives speak, whether we like it or not, and whether we think so or not. We are either speaking life or we are speaking death. We all have a worldview. If we want to have impact in our lives, we need to live out love. As has been pointed out by many wise people over the years, talk is cheap. This is much of the problem with our theology. In the end we can have all the theology in the world, but if we have not love we are nothing. If you're like me and you love theology, you need to be very careful that your theology doesn't become your master. The best theology is ultimately born out of a life of love. Love is the bottom line, not theology. We don't get our theology right first and then live out of that. Jesus says "follow me," and that is where we learn our theology. Love is about sacrifice. We come closer to God by living out a life of sacrifice, of denying ourselves, taking up our crosses and following Jesus. Ours needs to be a 'doing' theology. It is more about orthopraxy than orthodoxy. This is how the theologies of liberation in Latin America started. They were born out of deep suffering. As Jayakumar Christian, National Director of World Vision India, points out in his book, God of the Empty-Handed, “this theology (liberation or Dalit theology) is a call for theologians themselves to be converted, abandoning their ways and entering into the life of their neighbours, particularly the poor.” Good theology is useless unless it is applied. It may surprise some readers that it is in John's Gospel that the call to a 'doing' theology is emphasized most. In evangelical circles this Gospel is usually the one given to new Christians to give them a grasp of what it is to have eternal life and to believe in Jesus. But while proper belief is (rightly) emphasised by most evangelicals, I wonder how many new believers are taught the fact that, all throughout John's Gospel, faith is a verb. In John, the phrase “to believe” is mentioned nearly a hundred times, and not once is it mentioned as a noun. It is a 'doing' word. So when John finishes off his wonderful Gospel by telling its readers that it has been written that they may believe that Jesus is the Son of God and that by believing they may have life in his name, what he is really saying is that believing in Jesus cannot mean anything else but living out your faith. For John, believing in Jesus has nothing to do with mere intellectual assent. If we believe that faith in Jesus means nothing more than accepting him as your personal Lord and Saviour, we are not believing the Gospel of Jesus Christ. While John's Gospel is one of the more popular books of the New Testament for us evangelicals, the letter of James is possibly the least popular, mainly for its apparent over-emphasis on works. But the overarching message of James is, just like John, that faith is a verb. Both James and John affirm that faith without works is dead. James affirms John's message that believing is more than intellectual assent by pointing out that the demons “believe” too, and shudder. And John likewise affirms James' message by emphasizing that the way to have life in Jesus' name is by living it out, not by just saying you believe he is the Son of God. Both John and James believe in a 'doing' theology — a theology of love. Belief and action can never be separated in the life of the Christian, just as they were never separated in the life of Jesus. This was shown most beautifully in the movie The Imam and the Pastor. This true tale tells of a Muslim imam and a Christian pastor in Nigeria who were once bitter enemies, literally trying to kill each other, and encouraging their people to do the same. But after some time they saw the futility of their actions and instead wondered how they could resolve their differences and stop the killing. They eventually started to work together for peace in their battered country. They don't agree with each other's beliefs but they have matured enough to see past that and work for reconciliation between their people. When I first saw this movie, my blinkers went up and I struggled with the apparent compromise the pastor was falling into by agreeing to work with a Muslim. Shouldn't he be sticking to his beliefs and showing Jesus to this Muslim imam? Then it dawned on me. He was in fact doing exactly that. He was putting his faith into action, just like John's Gospel says. He was loving his neighbor and living out his love for Jesus. 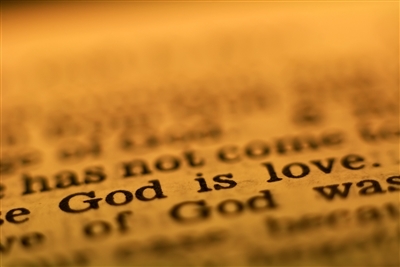 Jesus said the greatest commandment is to love God and love our neighbor. As N.T. Wright says in Surprised by Hope, “Love is not our duty, it is our destiny.” This is the end of life. And it is only through living a life of following the greatest love the world has ever seen that we get our theology sorted out. It matters what we believe, and right believing only comes from following the One in whom we find the grace to love, the One whom we love because he first loved us. This is what love is, that he laid down his life for us. Love is action, faith is a verb, and only from this comes our best theology. Courtesy Sojourners www.sojo.net. The opinions are those of the author's and do not necessarily reflect the position or policy of the Florida Conference.